​Hooray For Everything have been performing on the live circuit for over seven years and have established themselves as one of Sydney’s most sought after duos, having performed in just about every venue in and around town including Penrith Panthers, Star City Casino, Rooty Hill RSL and numerous corporate and private functions. 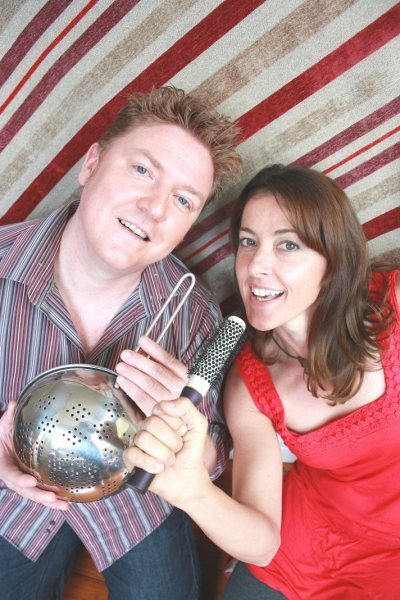 Consisting of the formidable talents of Andy Mayne and Nicolette Kenny, they each have over twenty years' experience in the music industry, having done thousands of performances between them in various bands and duos. With their wealth of musical knowledge, they can perform just about any song thrown at them - along with the 200 or so songs in their repertoire - and can deliver the right mix of music to cater for any situation be it a gig, party, wedding or corporate function. Nicolette has performed in numerous acts over her musical career, including Madonna The Concept (as Madonna), Jelly Bean Jam, Baby Loves To Cha Cha, Pyjama Party and Peppermint Jam. Nikky has also performed as a solo artist with her own material and had some success with one of her recordings spending six weeks on the charts and video hits. She has written for other recording artists as well as sung about such diverse topics as the weather and cat doors in her two thousand or so radio jingles. You may also catch her in various TV commercials and movies as her day job as an actress. Andy is a founding member of Jelly Bean Jam and has performed in numerous acts over a twenty year career in Sydney, including Baby Loves To Cha Cha, Kiss Me Pink, Get Rich and Peppermint Jam and has established himself as a versatile singer and guitarist. Able to play just about any style, he can switch from rock to blues to jazz or country giving him a deep pool of musical genres to draw from. So for a fantastic evening of fun and entertainment, book Hooray for Everything for your next event!